Reason #2: You will feel better about your own family. Jayne L. Victor portrays Violet Weston, the family matriarch. Photo by Chip Gertzog. As one critic put it, “Alcoholism, drug addiction, adultery….misbehavior: The list of pathologies afflicting one or another of the Weston family is seemingly endless, and in some ways wearily familiar. But Mr. Letts’ antic recombination…is so pop-artfully orchestrated that you never see the next curve-ball coming…” It could help bring a positive perspective on your own family, perhaps. Reason #3: It’s based on real life. David S. Rawlings as Steve Heidebrecht, Mary Zuzik Andrechik as Karen Weston and Nora Rice as Jean Fordham. Photo by Chip Gertzog. Reason #4: The movie doesn’t do the play justice. As Chris Jones from the Chicago Tribune put it, “Mel Brooks’ musical version of ‘The Producers’ was a fantastic piece of theater, but it made a lousy movie. Critics agree: August: Osage County, the movie, wasn’t great. So, if you saw it, come give it another try. 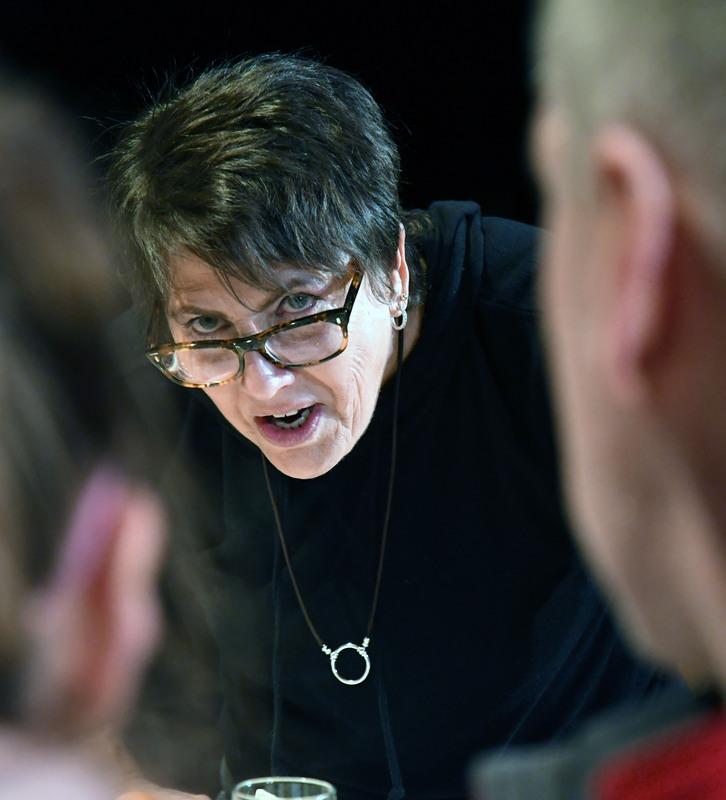 It’s a powerful play, and as Jones puts it, “In the theater, this play was made to howl like a prairie dog.” Come howl with us. Reason #5: You will laugh a lot! 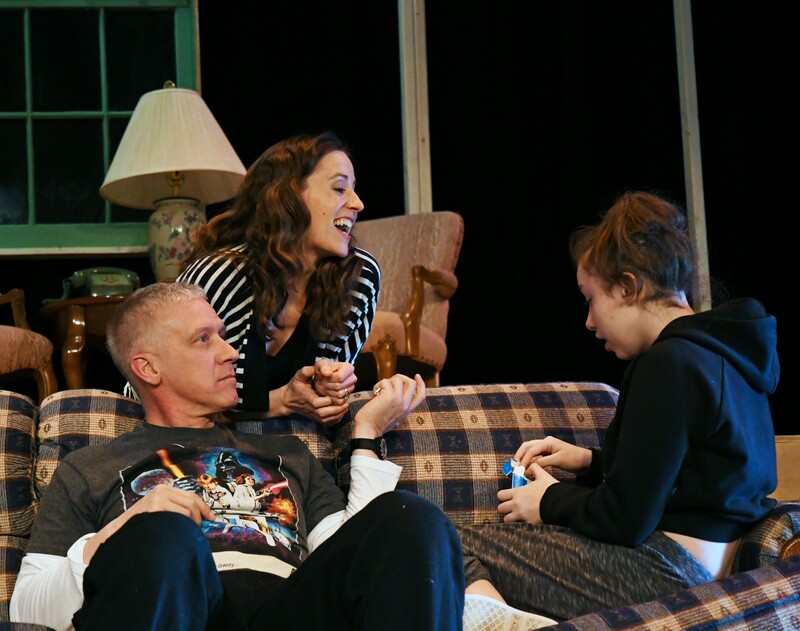 Considered by many critics to be a “tragi-comedy,” there is much to laugh at. Letts’ characters are so real, they come to life in ways that will surprise you. 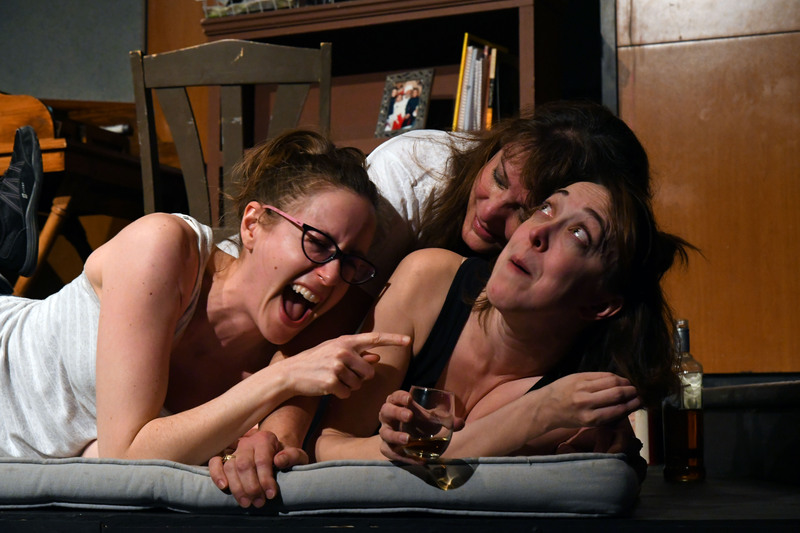 One critic wrote (of another production), that Letts’ characters will leave you, “…emotionally wrung out and exhausted from laughing, but you may still find yourself hungry for more.” Come laugh with us. John Coscia as Charlie Aiken reacts to wife, Mattie Fae, played by Deborah Davidson. Photo by Chip Gertzog. Reason #6: It’s an amazing artistic team. Did you see our last post? Enough said. If not, this production pulls together some of the company’s most veteran artists and some wonderful newcomers. Check out the link below. Reason #7: Ticket prices are so reasonable. 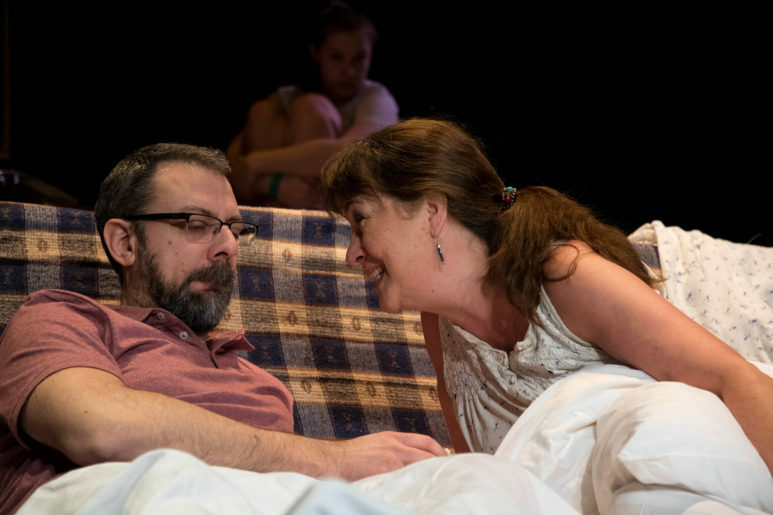 We hear from many of our patrons, “Why do I need to go into DC, when I can get live theater this good right here in Northern Virginia at a great price. You all are amazing!” We couldn’t agree more. The talent in the region is just extraordinary, and we are proud and committed to bringing great quality theater to our patrons at an affordable price. We are an all-volunteer organization, so we can pump most of our support into production quality and our standards are high. We give a break to seniors and students, and provide free tickets to organizations serving the underserved. Reason #8: Good seats still remain. The best seats remain for Thursday nights. Saturday and Sunday performances tend to sell early, and Friday night performances soon after. This is the week prior to opening, so you will want to get your tickets soon for the very best seat. 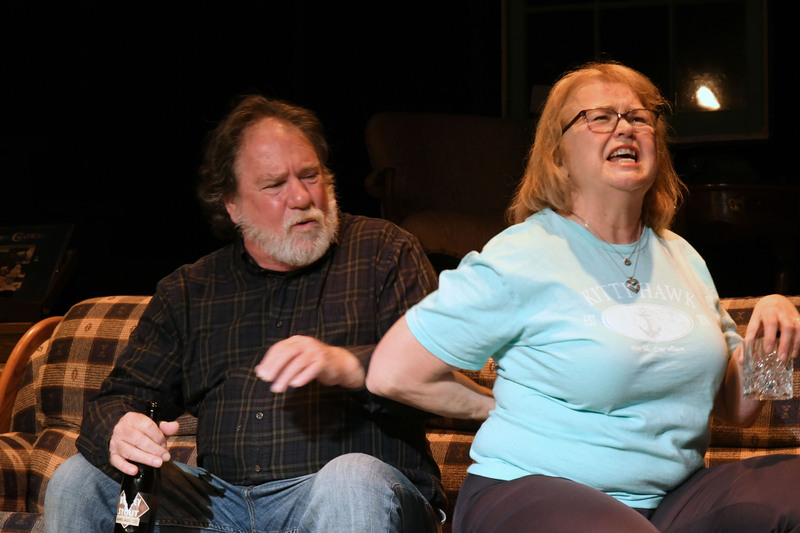 Barbara (Beth Gilles-Whitehead) confronts her husband, Bill (Clint Bagwell), as daughter Jean (Nora Rice) looks on. Photo by Chip Gertzog.